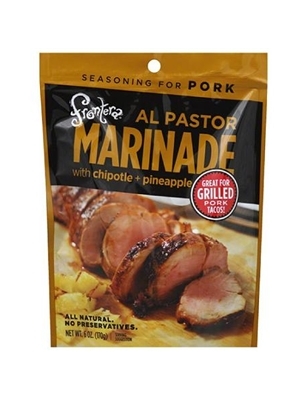 We eat our fill of Frontera Al Pastor Marinade For Pork tacos whenever we see charcoal rotisseries of chile-spiked pork and fresh pineapple. At home, we season pork tenderloin with this zesty marinade, then sear it on a hot grill. Pineapple juice from concentrate, apple cider vinegar, canola and vegetable oil, salt, chipotle pepper, tomato, onion, ancho chile, garlic, xanthan gum, spices, citric acid, paprika, distilled vinegar. ALL NATURAL. NO PRESERVATIVES. No gluten ingredients used.